The attached document has no changes to anything, just an explanation of how to claim lost wages for Company Buisness. Before entering a remote control zone, you must determine whether or not the zone is active. Also, you cannot operate a switch within a remote control before determining whether or not it is active. If the zone is active, only the remote control operate can give you permission into the zone and permission to operate any switches. This is a critical rule. Once a remote control is active and after the operator sweeps the zone, he does not have to protect the end with the locomotive. If you line a switch without permission he could unknowingly run through it. If you enter the zone without permission he could run into you. In both circumstances, you would be held responsible. It is important to keep up with changes in the subdivision general orders. For example, the zone limits at Lesperence Street are different than what the timetable shows. They actually extend down the switching leads also on the east side of the yard. If you get on a train that is sitting in track 14, don’t get ahead of yourself and line yourself out before determining the zone status, even if you don’t see a crew switching in the yard. With us being one with Little Rock, I’ve been scanning through the newly issued superintendent bulletins for 2019. They have taken our site specific bulletins and crammed them all into one bulletin. One key bulletin I want to point out is #7 - Securement of Equipment. They most important part is that it specifically states that locomotives handbrakes do not count. The St. Louis Superintendent bulletins are still in existence, but the Little Rock bulletins now have St. Louis info included in them as well. 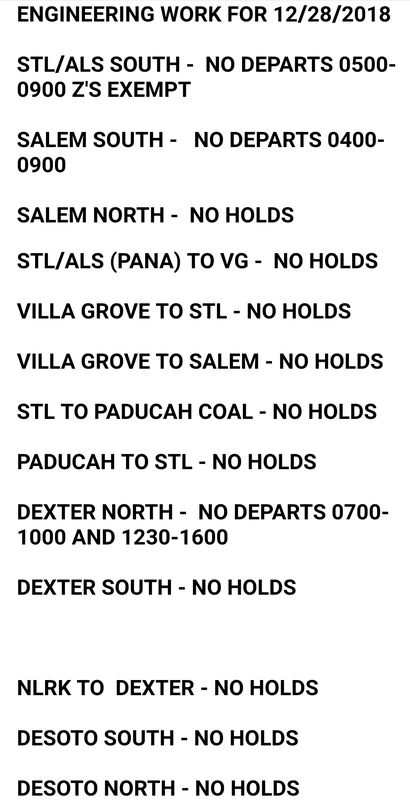 I read through the bulletin and there are a few parts in it pertaining to St. Louis, but the locations that were listed that said only two hand brakes are required are not listed. I highly recommended tying at least two cars down now in the 300 yard, East and West Auxiliary at Dupo, Cotton Belt 4, Airport Siding, and 1-6 Cotton Belt Yard. Go back to the ABTH securement rule. Tie down at least two cars, test them, reapply the brakes, secure the locomotives, fill out a securement sheet. There is a common misconception that another additional release test of the locomotives is required. 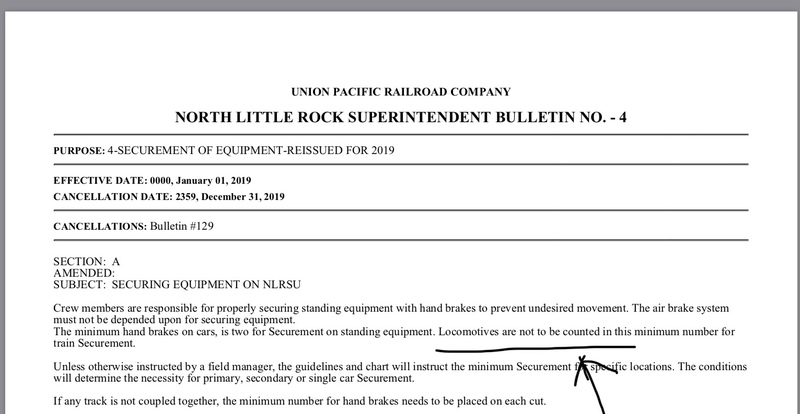 Securing Unattended Locomotives Rule 32.2.1 Step 6 says to comply with 32.1, which in a nutshell is tie the brakes and test, UNLESS COUPLED TO PREVIOUSLY TEESTED EQUIPMENT. With renewed testing for yellow flags coming, I thought a review would be helpful. There are increased distractions in the cab that require all of us to be alert. PTC, Trip Optimizer, the conductor’s log, fatigue, and personal issues. It is imperative that we all stay focused and alert. GCOR 5.4.2 outlines display of yellow flags for temporary speed restrictions. Part B outlines the procedure for when you see a yellow flag which you do not have a slow order for. The first thing to do is start reducing to 10 MPH. You must be down to 10 MPH 2 miles from the yellow flag. Remember, Cab Red Zone until you reduce to 10 MPH. Once you are 2 miles from the flag, one of two things are going to allow you to resume speed. Notice the word “or”. If you pass a green flag, when the rear of your train is beyond it, you can resume speed. The green flag must be 2 miles beyond the yellow flag to count. If you do not pass a green flag, the other item that will allow you to resume speed has two parts, and you must do both. If the dispatcher informs you that there is no applicable restriction, you cannot resume speed until the rear of your train is 4 miles beyond the yellow flag. Notice the word “and” in this part. If you’ve already gone 4 miles beyond the yellow flag and still have not reached the dispatcher, you cannot resume speed until you do. Yellow flag - Be down to 10 MPH two miles from the flag. Green Flag (must be two miles beyond yellow flag to count). 4 miles from yellow flag AND dispatcher.